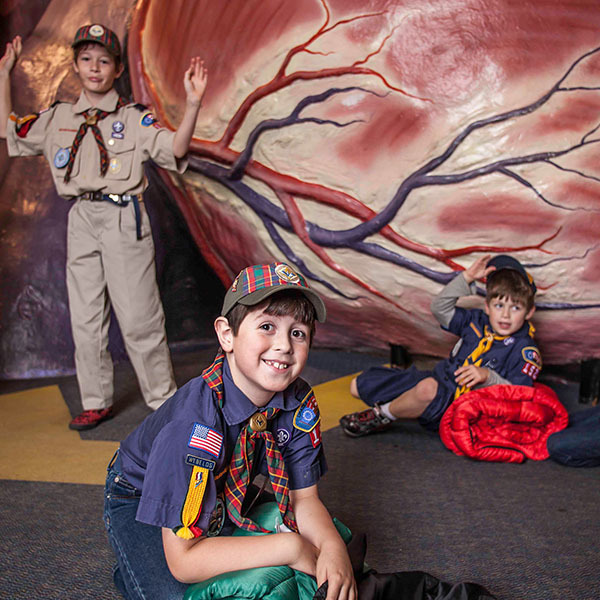 The Franklin Institute’s Camp-in is the perfect sleepover event for children ages 6-13 and provides an unforgettable experience for families, scout troops, school groups, birthday parties, and more! Where else can you sleep next to a Giant Heart or a 350-ton locomotive? *Special exhibits are not included; ask about discounted rates. **Restrictions apply; must show souvenir patch upon arrival; valid for children 13 and under. Click HERE to complete the registration contract. Registration closes at close of business the Wednesday prior to each Camp-In event date. For groups with fewer than 10 people, payment is due at time of booking. Groups of 10 or more must pay 25% at time of booking. Full payment is due three weeks prior to visit. At least one chaperone per every five campers is required. Register the exact number of participants including chaperones or your minimum anticipated number. If you need to increase the number, please check availability first. Your school can come for its very own overnight adventure! Groups with a minimum of 200 campers can sleep over on weeknights throughout the year.